Unmanned Aircraft Systems (UAS) are already being used to assist emergency agencies with responses to structure fires, wildland fires, traffic accidents, and crime scene investigations all over the world. Would you like to learn more about the benefits and challenges of standing up a UAS program in your public safety agency? 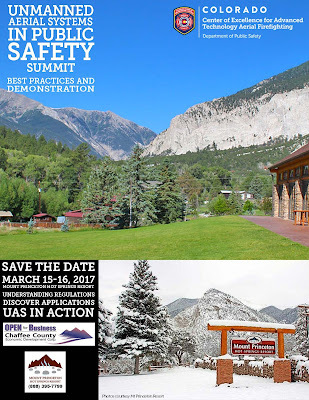 WHAT: The summit will feature demonstrations from vendors as well as practical information on standing up a UAS program. Learn more about this emerging technology and see it in action! WHERE: Mount Princeton Hot Springs Resort, Nathrop, CO.
MORE INFORMATION: For more information, contact Garrett Seddon AT garrett.seddon@state.co.us .